Inspiring learners to shape tomorrow's world! This is for Juniors only, who missed the initial testing date on April 10th. Teams of Math and Science students from each of the Flint Metro League schools in competition. HMS Jamfest is an after school event with food, games, activities. Tickets are sold during lunch the day of the event. $3. Senior Spring Awards Assembly - Invitations will be sent out for this assembly. This is only for students who missed the initial testing date on April 9th. Get your Broncho Press copy here! Early On Michigan Project Find / Child FInd - Project Find is devoted to helping individuals, parents, and people who work with families (known as primary referral sources), to connect with the special educational services that may be needed. In Michigan, eligible children, youth, and young adults may receive special educational services from birth through 25 years of age. Project Find Michigan is part of the child find component of the IDEA. For Birth to 3 yrs, contact the Early On Referral Specialist at 248 209-2084. For Ages 3 to 26 yrs call Holly Area Schools Special Services at 248-328-3170. How Holly got the "H" "Bronchos, Holly Bronchos, Let's Go!" 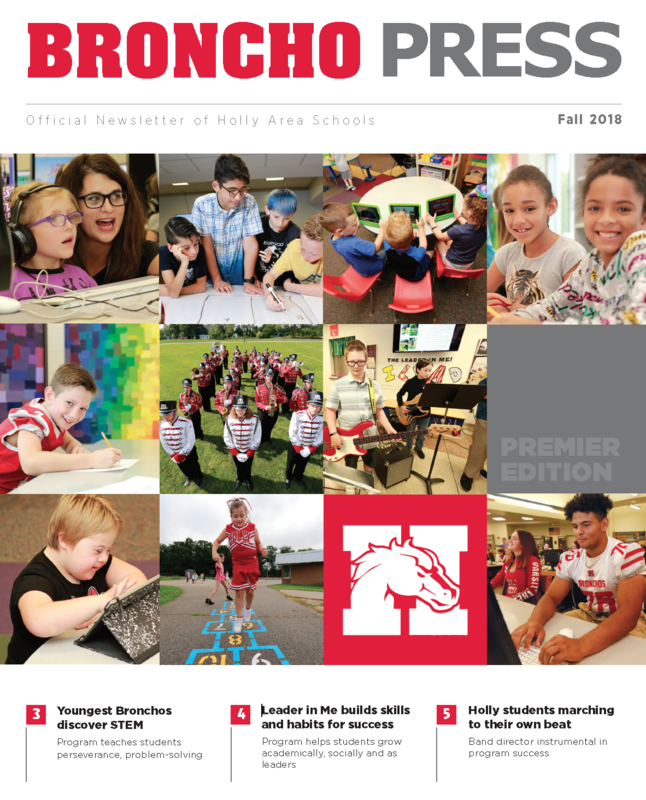 Since 1946, Holly has been known as the home of the "Bronchos." It's actually pronounced Broncos, but with an H. Short video from NBC 25 with more details. Welcome to Holly Area Schools Holly Area Schools is a genuine, caring community with supportive families. The district has great students, a hard-working staff with creative, innovative, and passionate teachers. There is a great positive momentum across Holly Area Schools! $15,000 in training dollars so far from the Project Aware Grant which supports social-emotional learning and mental health services in our community. 1st HMS is Michigan's 1st Leader in Me Lighthouse Middle School. Holly Elementary is also a Leader in Me school! Can't find what you are looking for? View the site map. If you experience difficulty with the accessibility of any web pages or documents on the Holly Area Schools district and/or school webpages, please complete an Accessibility Assistance Request.